Two years ago, we built a Bionic Iron Man Armor, a muscle sensor controlled repulsor system worn on the forearm. Well we're back again with a slick new sensor and a simplified bionic system. Our new "Bionic Iron Man Glove" still harnesses the power of electromyography to give fans the power to directly control an Iron Man-esque repulsor simply by flexing their muscle, BUT this time around the system is much easier to build and compact enough to fit entirely on the hand. 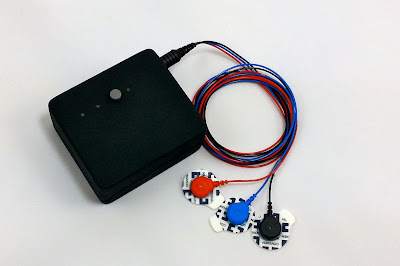 At the core of this new glove system is an Arduino-compatible Lilypad MP3 (an all-in-one microcontroller and audio player), Adafruit's NeoPixel ring, and our new MyoWare™ muscle sensor. 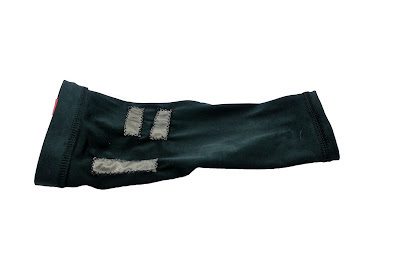 Using the bionic glove is as simple as sticking a few electrodes on your arm and flipping on the power switch. When the system boots up, J.A.R.V.I.S. (Tony Stark's computer intelligence sidekick) talks you through the power-on sequence. 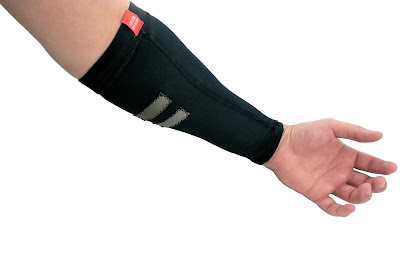 When the wearer flexes their muscle, the bionic glove will play the harrowing repulsor charging-up sound effect. Then, when the muscle is relaxed, the repulsor will emit a firing sound effect and pulse the LED lights attached to the palm of the glove. You can learn how to build your own bionic glove by reading our easy-to-follow tutorial posted on Instructables.com. A project kit is also available on our Kickstarter campaign as a funding reward for a limited time only. 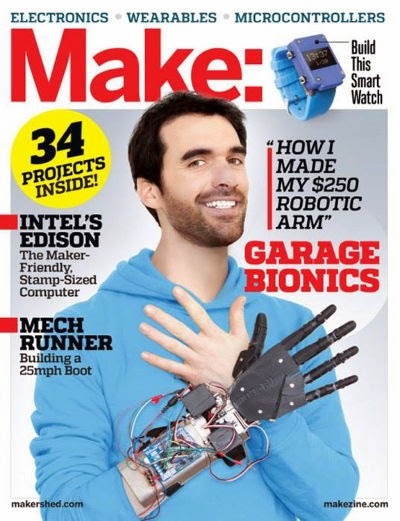 On the cover of MAKE Magazine! We've been collaborating with the awesome guys at Bionico Hand for a couple years now and we're really proud to see them make the cover of MAKE Magazine this month. Their mission is to create a low-cost opensource myoelectric prosthetic hand. We're proud to announce that Pololu Robotics and Electronics has joined our distributor team. Be sure to check out their great demo that uses our Muscle Sensor v3 to control a servo motor! We've listened to your emails and are pleased to announce that we are now selling electrode packs. You no longer have to go through third-party vendors to get more electrodes once you're used up our samples. Each pack comes with 50 electrodes. These are the same electrodes that come as samples with our products. Only $17.99 per Pack. Head over to our store to order! We've created a new open-source project, Muscle Mouse, as part of the 2013 National microMedic contest. The Muscle Mouse harnesses the power of electromyography to make physical therapy more fun and to make gaming easier for the disabled. At the core of this AAA battery powered device is the powerful yet low-cost Arduino Pro Mini microcontroller (a favorite among hobbyist and SparkFun Electronics BlueTooth module, and Advancer Technologies’ 3rd generation muscle sensor. The Muscle Mouse is designed to allow the user play the classic helicopter game (shown below) on any mouse compatible Bluetooth device. The user simply has to navigate to any of the many available websites that provide this game for free and position the mouse cursor over the game window. The Muscle Mouse gives the user the power to navigate the helicopter through the game course simply by flexing their muscle to move the helicopter up and relaxing the muscle to move the helicopter down. You can find all the files and documents you'd need to reproduce the Muscle Mouse down to the smallest detail here. 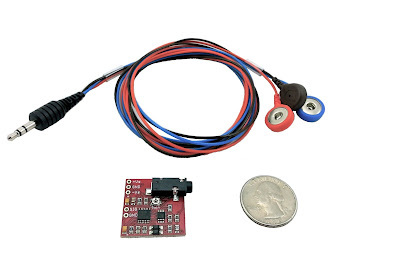 We are happy to announce that SparkFun Electronics has become a distributor of our Muscle Sensor v3 kits. For more details, head over to their webstore. Conductive fabric electrodes are a low cost and simple way to make reusable electrodes for sensing muscle activity. 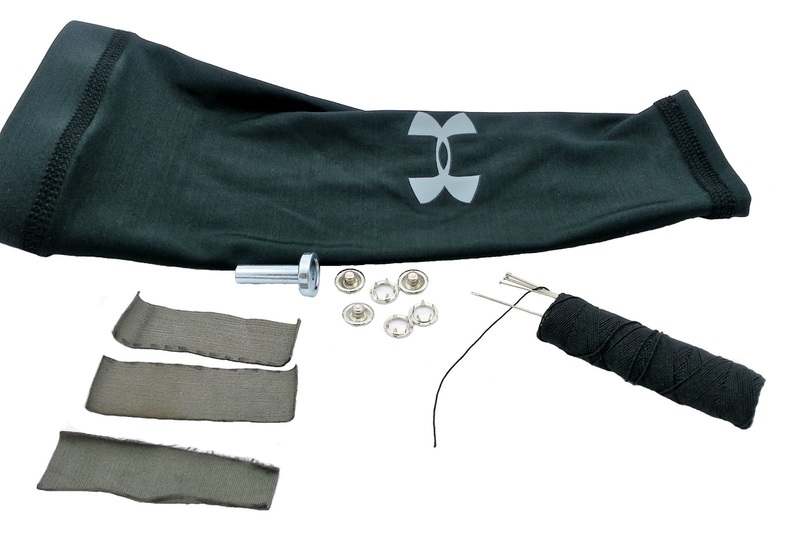 They can be sown into any type of garment or used with a strap. When dampened, these electrodes allow you to sense the tiny electrical signals of your muscles just like traditional medical electrodes. 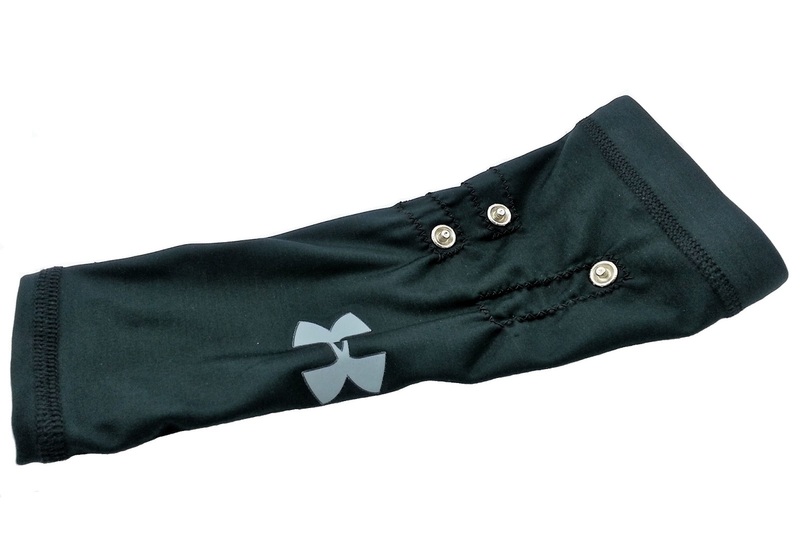 For this tutorial, we're going to use them in a sleeve to detect the muscle activity of the forearm muscles. Note: The button snap kit we used did not have a certain button snap size indicated but the dimensions below are typical for button snap studs that fit our cables and sensors. Units are millimeters. To make a conductive fabric electrode sleeve, we'll need to make three contact points above the muscle we want to sense. In this case, we're after the forearm muscles. If each connection is in working order, then you're finished! 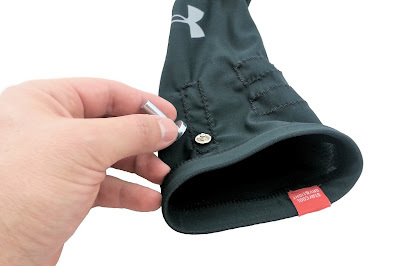 Make sure you head over to our webstore and pick up one of our sensors to use with your new conductive fabric electrodes. Muscle Sensor v3 Now On Sale! We are proud to announce our next generation Muscle Sensor. Our third generation sensor has a on-board port to directly connect our new cables right out of the box. No more hassle with getting the cables to connect to the sensor. 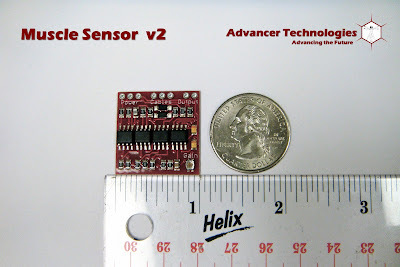 Our new sensors also come standard with a set of cables and sample electrodes yet still costs a fraction of the V2 sensors! Find out more information about this new cutting-edge sensor over in our shop! We are proud to announce our next generation Muscle (EMG) Sensor. 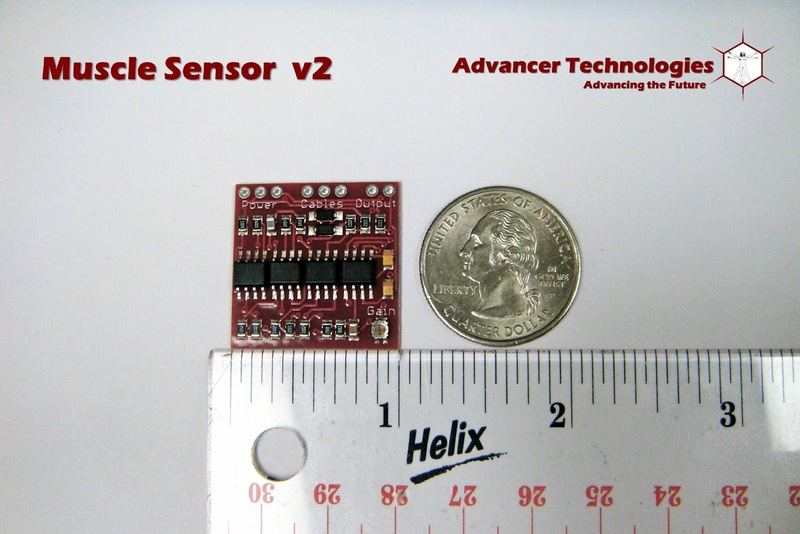 Our second generation sensor has shrunk to 1" to a side, over half the size of our Platinum Sensors! Not only has this new line of sensor dropped down in size but, thanks to our new fabrication partner, the price has substantially dropped as well. Here at Advancer Technologies, one of our main goals is to promote all forms of interest and learning into biomedical technologies. To help cultivate and educate future great minds and concepts in the field, we frequently post informative instructions and demo video of our technologies. We'll give you a 10% discount on your purchase! Then simply email us the link to your video or instructions and, if you've met our criteria, we'll refund you 10% of your last order. Now selling Muscle Sensor / EMG Circuit Kit- Gold Package Internationally! We're proud to announce that we are now going to start shipping our Muscle Sensor / EMG Circuit Kit- Gold Package to customers overseas. We would like to thank all those international customers who have showed an overwhelming interest in purchasing our products. Silver and Gold EMG circuit kits are no longer back ordered. The kits are now ready and will ship within 24-48 hrs of ordering. I want to thank everyone who placed Silver and Gold EMG kit orders for waiting and being patient for our parts to come in. For everyone that has been holding off on ordering a kit...order yours now before we run out again!